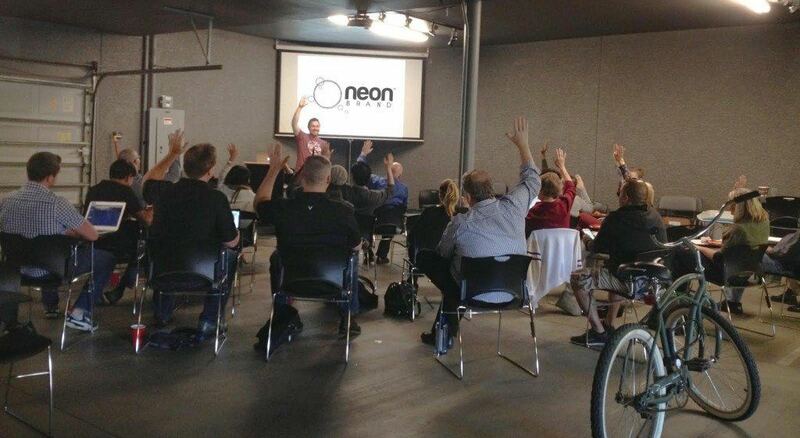 Today at Work In Progress, NeONBRAND founder Kenny Eliason presented at the SEO 101 Meetup. Attendees learned how to get their websites to rank highest on Google. Kenny broke website rankings down to a nutshell. For those new to SEO, there are two key ingredients to a high ranking website: high quality content and links. High quality, original content makes your website unique and stand out to Google. Google basically only knows how to rank your high quality content based off all the low quality content out there. Low quality content are articles that have simply been copy and pasted, or rewritten with minor adjustments. Duplicate content, or content pre existing on other websites is also considered low quality content. If you want to make sure your content is high quality, you’ll have to take the time to write it yourself. Time is something we’re all fishing for out there, but you need to invest in your content. The better your content the higher the SEO ranking. Period. There are no ways around it. Outsourcing, of course is an option, but just make sure your writers are as knowledgeable and competent as you are. The worst thing you could do is pay someone to write poor content for you. It’ll serve you well to hire top notch writers to do your outsourcing. If you find yourself stumped with coming up with ideas for high quality content, there are a number of resources that can help. HARO, or Help A Reporter Out is a great way to receive inquiries from reporters around the world about your areas of expertise. While you cannot limit or categorize the inquiries you get (and there will be a lot), if you take the time to answer some of these reporters, you’ll begin generating great content for your website. Sometimes you can write up to 1000 words responding to these inquiries, which is a big plus for Google rankings. In combination with high quality content, good links help out your website rankings a ton. Google takes into account how many links your website gets and if your site received them organically. More links equals higher rankings. In SEO, you hear a lot about the term backlink, which is a hyperlink that links from a webpage, back to your own website. Your backlink profile is like your citizenship grade in school. Google looks at your backlink profile to make sure you aren’t doing any dirty links, automatic links or “black hat” business. The cleaner the backlink profile, the less of chance Google will ding you and drop your website below your competitors. Is it really as simple as High Quality Content and Links? Yes. Bottom line, if your website produces a steady stream of good content, and is matched by a stellar backlink profile, your website will rank well. Just like any business, if you do your best and be honest about your business, you will in turn receive overwhelming support. And stay up to date on upcoming meetups by joining our group, here!